Towards the middle of the year, Honours students give a short 10-12 minute talk on their project for the year. Here's a copy of my talk, with a few extra details thrown in (since there's no time limit here!). This is mostly an introduction to the topic, with a bit of my current progress. First of all, we should talk a little bit about Active Galactic Nuclei, or 'AGN'. At the centre of nearly every galaxy we have a supermassive black hole. Matter that's nearby will begin to fall in, forming a disk and orbiting faster and faster as it does so, and will eventually accrete onto this black hole. Because we always need to conserve angular momentum, some of this material is slingshotted out of the disk along the poles of the black hole. We see this material as giant jets at radio and X-ray frequencies. These jets are made up of a plasma of either protons+electrons or electrons+positrons. They're relativistic, at least on parsec scales and possibly up to kiloparsec scales. There are also magnetic fields threading the jets, although where this field is generated isn't fully understood yet. To gie you an idea of scale here, this is Hercules A (right), also known as 3C 348. It's the giant elliptical galaxy in the centre of the image, and at optical wavelengths, it looks quite normal. But when we look in the radio (pink overlay), we see massive jets of material coming out from this galaxy. These are in fact about 1.5 million light years long, completely dwarfing their giant elliptical host. These jets extend vert far outside of their host galaxy into the Intra-Cluster Environment (ICE), and so it's reasonable to think that the properties of the environment could have a significant impact on these jets. This is something that's relatively well-understood and there are lots and lots of simulations of radio jets which support this idea. There's also some observational evidence to back it up as well. This image is showing a source from the Radio Galaxy Zoo catalogue, with the central galaxy indicated by the green star and the heat map showing the radio jets. We can immediately see that these two jets are very different. One flares very close in to the core and then peters out a wisp, whilst the other travels much farther and terminates with a hotspot. This is quite an extreme case, and such sources with extreme jet differences are known as Hybrid Morphology Radio Sources, or HyMoRS for short. Since these two jets have been produced by the same material accreting onto the same black hole, it stands to reason that their asymmetry is caused by the environment. This is a case of nurture over nature. So if we really want to understand how jets grow and evolve and why they come in so many shapes and sizes, we want to know as much about their environment as we can. Unfortunately, we don't have really great measurements for this. Key parameters for the environment like density or magnetic field strength would typically be measured using X-ray observations. But these observations are biased towards denser or richer environments, and to objects that are nearer to Earth. So the values we get for things like density in the ICE come with some significant uncertainties attached. When we then try to run simulations or interpret observations, the uncertainty is passed on to these measurements and it's difficult to interpret the data. To compound this issue even more, a lot of the large-scale surveys coming online are being done at radio wavelengths. For the Australian Square Kilometre Array Pathfinder (ASKAP), two surveys in particular, EMU and POSSUM, are going to be observing large amounts of the sky and lots of new radio objects. EMU alone is expected to observe over 70 million sources, where only 2 million are currently know. X-ray and optical surveys take much longer to run, and simply won't be able to keep up with this demand for environment measures. What we need are better, more robust, estimates for the ICE, and our saviour might just be in the jets themselves. This is where my Honours project comes into things. This year, I'm investigating how Faraday Rotation could act as a measure for the ICE. My task is to simulate radio jets and their environments and see how different setups affect this Faraday Rotation that we can observe. But what is "Faraday Rotation"? Linearly polarised light through a non-magnetic medium (top) and a magnetic medium (bottom). Right at the beginning, I mentioned that AGN jets are plasma and that they also have magnetic fields threading them. This means we have moving electric charges spiralling along magnetic field lines, and this ultimately results in synchrotron radiation. In fact, this is one of the main emission mechanisms for our jets. This emitted light is linearly polarised. All linearly polarised light can be thought of as the combination of a left- and right- circular wave component, and in a vacuum, these two components sum together to give linearly polarised light. But if this light travels through a magnetic field, then things change. The refractive indices are different for the two circular components. This means that they will travel at different velocities - one lagging behind the other - and when they meet up again at our telescopes, we see this as rotation of that linearly polarised light. If the magnetic field is varying as the light moves through it, then it will be rotated to lots of different angles. These angles all superimpose, making it look more and more like depolarised light. This is Faraday Rotation. If we can find a way to relate the amount of depolarisation to the properties of the environment that made it depolarised, then we could use this as a measure for jet environments. Looking at the first equation, if we go through and do some physics then we know that this rotation angle is a function of the square of the wavelength that we're looking at. But we've also already established that it's going to depend on the environment as well, and this is the constant of proportionality known as the Rotation Measure, or RM. The key thing is that the RM is a function of both the density ('n' above) and magnetic field ('B') in the medium, although only in the direction of the line of sight. Now we can't measure intrinsic angles of polarisation, however we can measure relative rotations in the emission across the jets. Now, using the equations above, we can interpret these rotations and perhaps determine, at least in a statistical sense, what the required distributions were for the density and the magnetic field in the ICE. My aim, then, is to model this density and magnetic field, do some mock observations of jets through that modelled environment, and see what the distribution of polarisation angles is like. So now I'd like to go through a little bit of the work I've already done. This has mostly involved implementing some pre-existing models for both the ICE and the radio jets, and for both regions I'm modelling the thermal electron density and magnetic field strengths so that I can use that RM equation. First I'll talk about the models for the ICE. I'm working with a spherical galaxy cluster with a radius of 1 Mpc, which I then resolve down to a scale of 5 kpc. This allows me to simulate some of the finer detail without making things too computationally expensive. For that density parameter 'n' I just use a simple power law, inversely proportional to the square of the radius (shown above). For the magnetic field, we use a slightly more complicated model. The nitty-gritty details are not so important, but what matters is that we want both large and small scale fluctuations in the field strength. To model a field that varies with different periods, we seed the initial distribution in Fourier space. We also convolve this with our radial profile above so that the field is strongest in the core and weakens as we go further out. So we have our density and magnetic field distributions set up for the environment. Now I turn my attention to the radio jets. Since these are also magnetic, any emission they generate can be rotated before it even leaves the confines of the radio lobes. Above is a very simple diagram of the lobe structure I'm using, which is ellipsoidal, or football-shaped. The central black hole would be located right at the centre of this ellipsoid, with the jets coming out to the left and right. To make things simple to start with, I'm just assuming a constant density inside the lobe. In order to get lobes that are far longer than they are wide, the jet must be pretty under-pressured, so I set the density to only be 2% of the density in the core of our cluster. When it comes to the magnetic field, I make things a little bit more complicated. I'm splitting things into two sections. 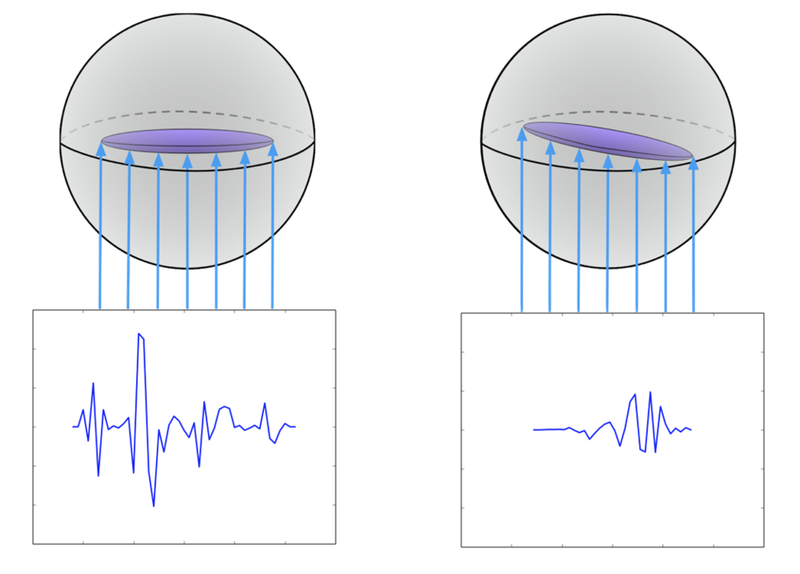 The first of these is called the "sheath": this is a thin outer layer on the ellipsoid where the magnetic field is wrapping toroidally, and it's shown by the purple arrows above. The second region is inside this sheath, and is known as the "spine": this is the core part of the jet which assume is randomly orientated, and these are the smaller red arrows. These are magnetic field structures we see when we simulate jets, which is why I'm implementing it here. There's also some evidence of this observationally too. Since the RM depends on the magnetic field directed along the line of sight, transverse gradients can be seen if you observe the lobes from top to bottom. At the top and bottom, the purple sheath is pointing directly towards or away from us, giving a larger RM. At the middle, the sheath is moving perpendicular to our line of sight, and so won't factor into the RM at all. We now have some basic models for our ICM and our radio lobes; this means it's time to see what kind of RMs we'd observe with a telescope. I'll walk us through what the diagram below is showing. Up the top, I have some schematics to show the system that I'm doing my mock observations on. The grey sphere is the ICM, and that purple football is the radio lobes. The blue arrows show our lines of sight: these are the paths that light takes from the radio lobes to our telescope. On the left I have the radio source pointing straight out to the left and right, whilst on the right, one jet is angled slightly away from us and the other slightly towards us. The plots on the bottom are showing the RM as a function of horizontal distance swept along the jet. For the system on the left, with our radio source flat, we see mostly random fluctuations in the RM. There's one larger spike, but it's mostly just noise from our noisy ICM magnetic field. Things look very different on the right. First, the plot is a little shorter; this is because we're viewing the radio source in projection. We can also see that the jet pointed away from us now has effectively zero RM. All of those big spikes have been flattened out. For the jet pointed towards us, the amplitude is at its maximum and it's varying between maximum and minimum quite quickly. We can understand this in terms of the path lengths for that emission. For the left-hand case, the emission has mostly travelled the same distance from the lobes. But for the right-hand case, any light that's emitted from the jet pointing away from us has to travel through more of that magnetic ICM. That means it'll be rotated to more random angles and these will tend to cancel out to give us zero RM. For the jet pointing towards us, there's a lot less magnetic ICM to move through, and so the light isn't so heavily depolarised. This is a really interesting result, and we can already see how even slight differences in the orientation of our jets, or any of their parameters, could mean large changes in the RM. If we can characterise these changes, then we can learn a lot about our radio jets and their environments from this RM method. I've said a lot about what I've already looked at, but there's still another half-year to go. So what's next on my agenda? My main focus through all of this is to improve my models. There are still a few changes that could be made to the ICM models, like including temperature variations or changing the magnetic field scales. Mostly, I'd like to focus on the radio jets though. These are very complex structures and my current model is incredibly simplistic. I can investigate how things will change if I place the jets, say, just behind the ICM rather than in the middle. There's also a lot of room to make that jet magnetic structure more complicated by including cocoons and intermediate phases. Another point of potential interest is in something termed "electron ageing": this is the idea that electrons will emit less and less of this synchrotron radiation as they get older, so parts of the radio lobes that have more old electrons than new are going to be fainter, and this is something that will change as the lobes expand and get older themselves. Finally, the holy grail for me will be to use radio jet data from more complex numerical simulations. These are generated using relativistic magnetohydrodynamics (RMHD), so the magnetic field and density structures that come out are far more realistic. However, these simulations end up being quite large, so including them in my model will mean that I'll need a lot more computing power.